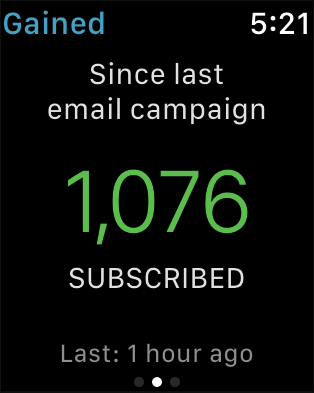 To get quick updates on your email campaigns, connect Mailchimp for iOS to your Apple Watch. Track activity on your list, check on campaign performance, and get notified when a scheduled email campaign sends. 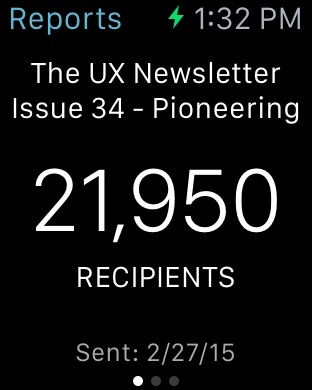 In this article, you’ll learn how to use Mailchimp for Apple Watch. The Apple Watch app requires an iPhone 5s or later. After you download Mailchimp for iOS 9.3+, you should find it on your Apple Watch immediately. 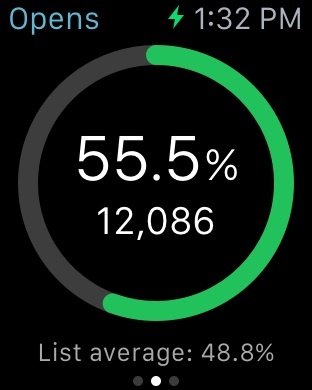 If you don’t, change your settings in the Apple Watch app. In the app, tap Mailchimp and use the toggle to select Show App on Apple Watch. When you open Mailchimp on your Apple Watch, the first thing you’ll see is a report overview for your most recently sent email campaign. Continue to swipe left to view the opens and clicks for that campaign. The Reports screen shows the campaign name, the number of recipients, and the date the campaign was sent. The Opens screen shows the open rate, the number of unique opens, and open average for the list. The Clicks screen shows the click rate, the number of unique clicks, and the click average for the list. To view other recently sent email campaigns, press and hold the screen to open the navigation menu. From the menu, tap Switch report to choose from up to 16 recent campaign reports. You can also keep track of the number of subscribes and unsubscribes. Apple Watch shows information on up to 24 recent lists from your Mailchimp account. To select a list, follow these steps. Press and hold to open the navigation menu. 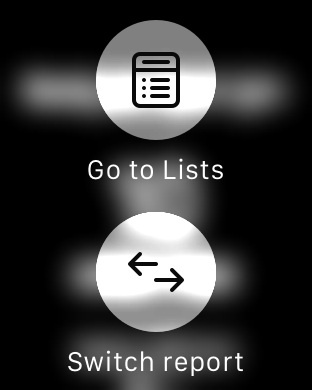 Scroll to the list you want to work with, and tap the list name. To view the number of subscribes and unsubscribes for that list, continue to swipe left. The Gained screen shows how many people signed up after the last email campaign was sent, and how long ago the last new subscriber was added. 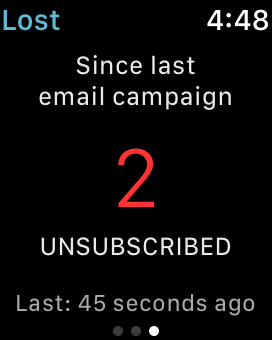 The Lost screen shows how many people have unsubscribed since the last email campaign was sent, and how long ago the last person unsubscribed. We’ll send two types of notifications to your Apple Watch. If you’ve scheduled an email campaign, you’ll get a notification when your campaign is on its way to your subscribers. You’ll also receive a notification after you push a campaign to your iPhone. To clear a notification from both devices, tap Dismiss on either the Apple Watch or iPhone. The Campaign Sent notification displays the date and time the campaign was sent, the campaign name, the list the campaign was sent to, and the number of recipients. 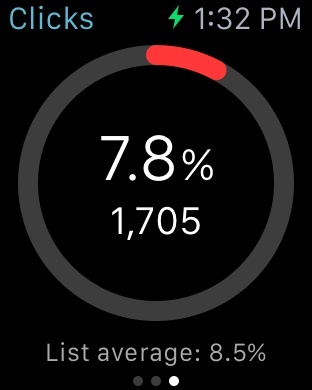 When your Apple Watch battery is low, the Campaign Sent notification only displays the campaign name and Dismiss button. When you push a campaign preview to your mobile device, Mailchimp displays a notification on your Apple Watch. Tap the notification on your iPhone to view the preview. Or, tap Dismiss on your Apple Watch to remove the notification from your watch and the preview from your phone. To learn more about how to use Push to Mobile, check out our article on how to edit and test mobile styles in a campaign. Manage your account from your iPhone or iPad with Mailchimp's mobile app. Learn how to get started.